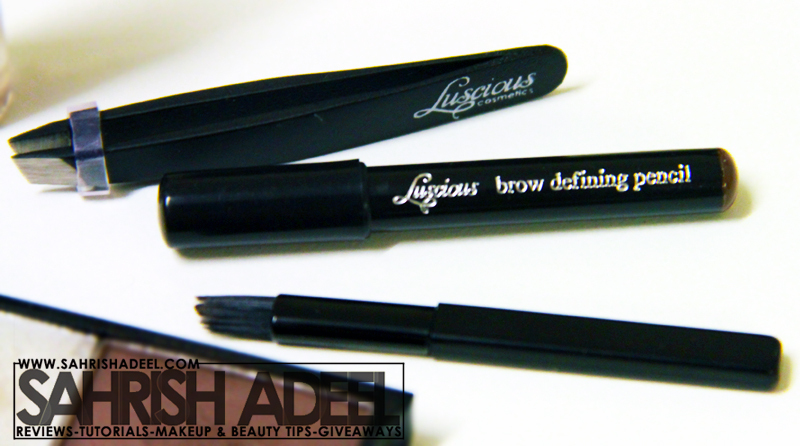 Perfect Brows Tool Kit by Luscious Cosmetics - Review & Before n After! | Sahrish Adeel - Malaysia based Pakistani Beauty & Lifestyle Blogger! Perfect Brows Tool Kit by Luscious Cosmetics - Review & Before n After! Well groomed eye brows always compliment the whole look and a this Perfect Brows Tool Kit helps me all the time. Luscious Cosmetics is a Pakistan based company and providing so many good makeup products and tools. 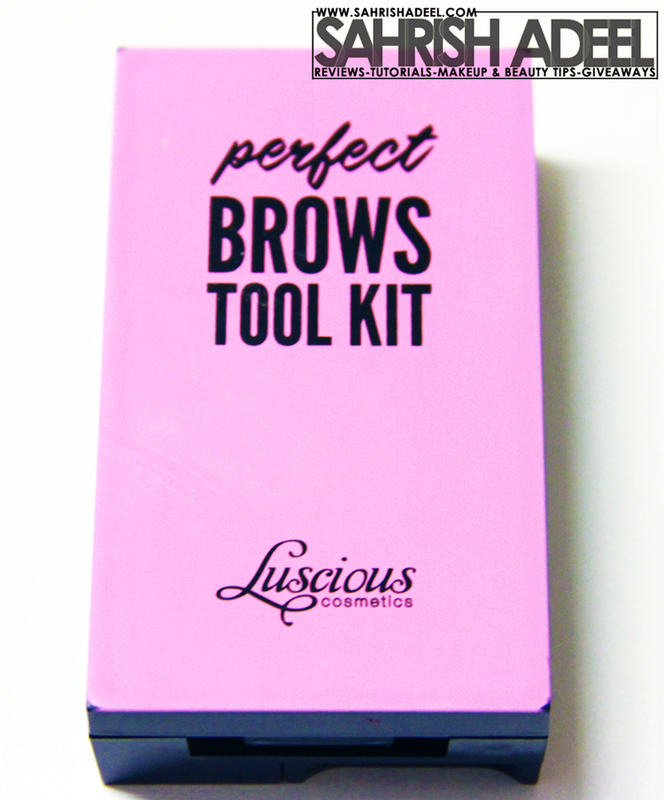 This Perfect Brows Tool Kit was launched in 2011 and I believe it helped many people. It comes in two shades; Light to Medium and Medium to Dark. I bought one in Medium to Dark as soon as they launched it and I am using it since then. Lets see how I found it. This kit comes in a regular hard paper box that has step by step instruction written at the back. (Unfortunately I lost it before I took its picture). The kit has a beautiful pink color on the top as you can see in first picture. Inside it, it has a mirror, a mini tweezer, a mini brow pencil, a mini angled brow brush & a clear mascara for brows. On the lower section of this kit, it has brow powder and brow wax that slides side wise. Extremely useful and handy, specially when you are on the go. Brow powder is nicely pigmented and has a really good staying power. Clear mascara keeps the eye brows in place for long hours even when you are sweating. Angled brow brush works great. Eye brow pencil has the perfect softness to fill in the eye brows. Brow wax gives a nice shine to eye brows and make them look healthy and stand out. See how amazingly it fills all the gaps. 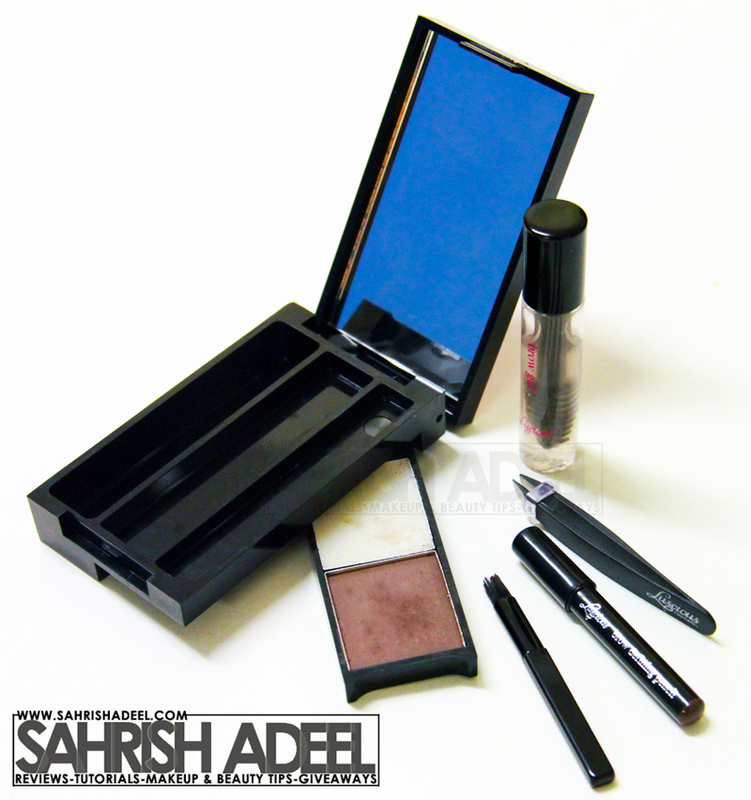 This kit is available all over Pakistan in mostly every store that sells cosmetics, for PKR 975. Luscious Cosmetics also offer home delivery service if you order online from their website. Check out their website and Facebook fan page. They offer free delivery on order above PKR 1000. Totally get this kit if you a perfect solution to keep your eye brows well groomed, filled up and in place =P all the time. I hope you have liked this review. Follow my blog if you haven't already. Join me on Facebook, Twitter & Youtube.